The following resources were created by the Integrated Pest Management Working Group (IPM-WG) or its participants. Or jump down to see a list of additional online resources selected by the IPM-WG. PestList a free email list with over 600 individuals worldwide was created by the IPM-WG as a resource to support individuals and institutions in implementing IPM in their collection holding institutions. Individuals are invited to submit reasonably sized images (under 1 MB) to the list to receive assistance with identification. The IPM-WG is not able to guarantee the accuracy of any identifications made by individuals on the list. Bed bugs have become an increasing concern for libraries with circulating collections. Bed Bugs: Lifecycle and Identification was created by IPM-WG members to provide more information on understanding how to identify and monitor for bed bugs. Texas Pest Flash Cards -These cards, submitted by staff from the Ransom Center at the University of Texas, build on the set developed by Sir Sandford Fleming College build on the set developed by Sir Sandford Fleming College with the addition of pests that might be found in Texas and the American Southwest. They include a line drawing, pertinent facts and a comical drawing. Download Texas Flash Card1, Card2, Card3. ID Flash Cards: These ‘flashcards’ created by the students of Sir Sandford Fleming College’s Museum Management and Curatorship program give some descriptive appearance information along with a black and white line drawing and some comically presented facts on behavior. ID Cards: These ‘flashcards’ were developed by Christina Cain, University of Colorado Museum of Natural History. The cards contain color images and are aimed at the front-line staff in an institution who may come across these insects but not be familiar with their identification. The goal is to enable them to make an initial ID and then send the specimen and information on to members of the institution’s IPM team. This document is designed to be printed, folded over, cut into quarter sheets and, if desired, laminated to create several short Pest ID Cards. The Insects Limited website has a page devoted to information on food, life cycle and trapping of insect pests pertinent to museum collections. 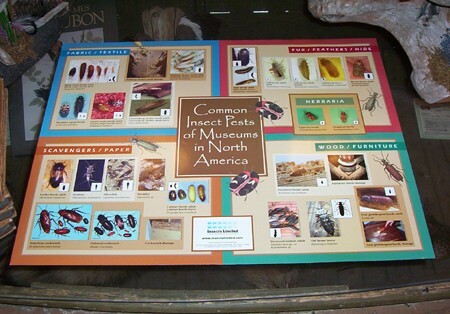 Additionally they offer a poster on Common Insect Pests of Museums in North America through their online store, which is useful for identification and training. If you find exit holes in wooden collections Insects Limited’s Wood Infesting Insect Identification Chart with details on the size and shape of insect holes and the physical properties of the debris from those holes can help you determine what type of wood-infesting insect may have done the damage. Insect’s Limited developed a one-page fact sheet on the Dirty Dozen Museum Pests with annotated images to help identify the top twelve most common and problematic pests that affect many museum/archive collections. The IPM Working Group developed MuseumPest ID for PMPs to assist Pest Management Professionals who may have extensive experience in dealing with pests in commercial, residential or academic settings and less experience with the types of insect pests that are particularly problematic for museum collections. Other resources for constructive collaboration with PMPs may be found on the Prevention – Pest Management Professionals page. Members of the IPM-WG gave a presentation entitled Integrated Pest Management and the Case of What Dun It? at the 2007 American Association of Museum’s Annual Meeting. Participants were presented with hypothetical worst-case scenarios and a series of clues in this hands-on session. The goal was to learn how to use straightforward analytical tools and references to determine a problem”s source, and propose treatment strategies, become familiar with the principles of IPM, and develop some handy skills in basic pest identification, and the trail of evidence they leave behind. Read the program handout. Margot Brunn and Shannon Coles of the Royal Alberta Museum have created a “Flies in Museums” PDF fact sheet for the identification of common flies and to educate museum staff on the damage they can cause. The ability to magnify and capture an image of trapped pests is helpful in obtaining a proper identification. Our Monitoring – Suggested Supplies page lists various digital USB microscopes and other tools that have been found useful by members of the IPM-WG and the wider PestList community. For flying insects, a spray bottle of Windex or household cleaner has been found useful for incapacitating insects until you can capture them. After capturing the insect, freezing is the easiest and least expensive way to permanently immobilize them while preserving the identifying characteristics. Alternatives include placing the specimen in a container with a small cotton ball or paper towel wetted with acetone or ethyl acetate (nail polish remover), or ethanol (~70%), or completely submerged in isopropyl alcohol (generally found in rubbing alcohol). This is a curated list of other useful identification resources available online. The Whatseatingyourcollection website is updated by the Odyssey Group, an informal annual meeting of IPM professionals in the cultural heritage sector in the United Kingdom that advocate this discipline of preventive conservation. The Museum of Comparative Zoology (MCZ) at Harvard University maintains an online database for primary types in the entomology collections. The MCZ insect type collection, one of the largest in North America, currently preserves the primary types of more than 28,000 species, representing 29 orders, 565 families, and 7,578 genera. In addition to such information as type label data, type stage and status, current species name (if available), the database includes high resolution images of the type specimens. This website run by volunteer naturalists bills itself as a site for “Identification, Images, & Information For Insects, Spiders & Their Kin For the United States & Canada.” There are numerous images of insects that can be helpful in identification. A search can be made on the common name (e.g. booklice, cigarette beetle, dermestid). Registered users can post images for help in identification. Urban Pest Control Research Center website. The company is dedicated to conducting research, training, and control programs on household and structural pests. The professional entomologists at the UPCRC conduct and supervise field research, provide insect identifications, conduct training courses and seminars, and design integrated pest management programs for commercial, government, and residential sites. The website contains information on identification, training and research. A wealth of information and identification tools for dermestid species. Insect Images website is a source for entomology photos. The site, which offers free images with registration, is a joint project of the Bugwood Network, University of Georgia and the USDA Forest Service. The Bug Network website for The Bugwood Work Group. The mission for the group is to gather, create, maintain, promote the use of, and economically distribute digital information both as resources and as tools to enhance and complement information exchange and educational activities primarily in the fields of entomology, forestry, forest health and natural resources. The University of Georgia College of Agricultural & Environmental Sciences Cooperative Extension Service. Information on different common pests as well as extensive links to pesticide information. Information for moth identification is available on this website from the Mississippi State University and Mississippi Entomological Museum. Penn State Department of Entomology with information on extension, education and more. A search of the site links to other documents. Information from Do-It-Yourself Pest Control on the Powder Post beetle. Degesch America, a fumigant manufacturing company has a Pest Gallery with information on species. Information on the following categories is available: appearance, life history, distribution, damage, and control. The links on the Appearance and Damage attributes will open a small window showing the bug or damage, respectively. Nature Photographer’s personal website with some high quality images of individual insects. Online museum pest identification poster.